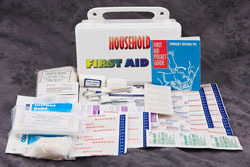 Household Kit First Aid Kits make Thoughtful Gifts! This kit is ideal for the busy household. This is arguably our best value. For the home, a small office (does NOT meet WSIB Regulations, though. You can use this if you're self-employed and working at home), workshop, garage, kitchen, cottage... It contains a variety of supplies to address most requirements. Save on shipping! Buy more than one. We don't charge extra shipping for additional kits! First Aid Kits also make great promotional giveaways! Ask about having your own logo or message imprinted on the kits!